Have you ever wanted some help as you struggle to cycle up a hill? Then perhaps bikejoring is the sport for you. It involves attaching dogs to a mountain bike, that then pull it forward as the rider pedals and steers. Although she no longer rides competitively, she still meets with other fans of the sport and often trains in Pembrey Country Park. 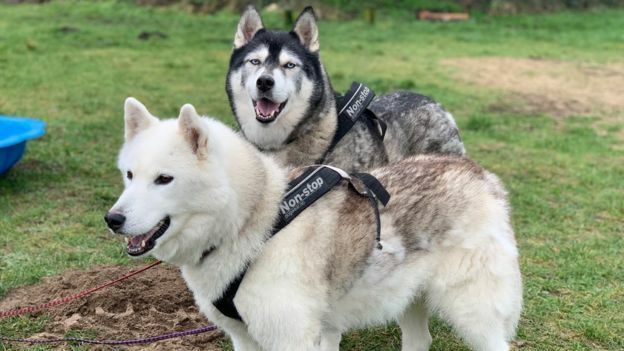 Ms Lane, who is from Cardiff and has two huskies named Diesel and Kaya, explained that the bikes are equipped with a bikejoring arm, which stops the lead becoming tangled in the wheel. It is key for the dogs to understand voice commands, as they pull their rider through the countryside. Ms Lane’s dogs have been taught Siberian commands, as they are Siberian huskies. Of course, the rider has to be completely aware of any risks around them, and know what might trigger their dogs to act up. “You have to be very much aware of your surroundings, you have to be aware of potential hazards as with anything,” Ms Lane said. Ms Lane stumbled onto bikejoring when she was considering buying a husky, and decided to attend a canicross event – which involves running with a dog attached to the waist. From then, she was hooked. “That gave me the confidence then, when I finally did get my first Siberian, that I would be able to give them what they needed. Sarah Cochrane, a fellow bikejorer, has five dog. The veterinarian explained that she would normally only bikejor with one dog at a time, but there are some races where two dogs can pull a bike at once. She added that most people start the sport doing canicross, before they start bikjoring. Following that, some are tempted into “dryland racing” where a cart is pulled by up to eight dogs. 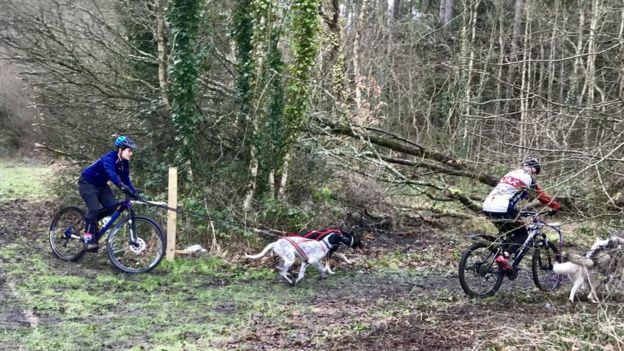 Ms Lane, who also skis attached to her dogs, originally travelled out to compete for Team GB in canicross, before she took part in the bikejoring events, which saw riders racing along a ski resort and up a black slope. “It was just wonderful being part of a team representing your country in the very early stages of a sport that nobody had ever heard of,” she said. The sport is a way to combine two things she loves – spending time with her dogs and mountain biking. “It doesn’t really matter how fast you go, but we’re out in the countryside, out in the fresh air,” Sarah said.